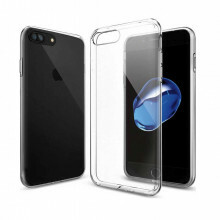 A unique case designed specifically for the iPhone 7 Plus . Made of high quality eco-leather . Thanks to its slim design does not add unnecessary bulk to your phone and make comfortable use and protects it against drops, dust and damage. The mobile fits perfectly inside clip compartment which freely leaves the function buttons and ports of the device, so you can handle it and connect the charger or your headphones without having to remove it. It has a window to the front side to have direct access to information while mobile is locked.